The new Commodore 64x – as sold by Commodore USA, a fan startup company which formed last year and acquired the licensing rights to the Commodore and AMIGA brands – is a fully functional PC replica of the famous original ’80s computer, updated for today. It’s powered by a dual-core Intel Atom D525 1.8GHz CPU on a mini-ITX motherboard and sports Nvidia Ion 2 graphics, 2GB of RAM (upgradeable to 4GB) and even an optional Blu-ray optical drive. the C64x runs Commodore OS, a Linux-based operating system which can emulate the old C64 interface, letting you run “classic 8-bit, 16-bit and 32-bit era software” originally made for Commodore PET, Vic20, C16, C64, C128 and AMIGA (and you can even toy around with BASIC). The C64x is available for sale in a number of configurations from Commodore USA online here (the Basic version retails for US$595), and you can find out more about the complete specs here. Smartphones to predict NSW travel times? Last November, the RTA launched a three-month competition to predict travel times on the M4 Motorway, one of Sydney’s most congested roads. The transport agency wanted to forecast a motorist’s travel time on the M4 from 24 hours to 15 minutes ahead of time. It offered competitors access to two years’ worth of historical data, from 2008. José P. González-Brenes from the famed Carnegie Mellon University in Pennsylvania and Matías Cortés of Canada’s University of British Columbia — won the challenge. If Team Irazu’s traffic model is implemented on smartphones, motorists would be able to download an RTA app and enter their location and destination, a la Google Maps, to chart their journey. At the moment, the prediction feature has yet to be embedded into RTA’s live traffic web page. The carmaker Rolls-Royce has unveiled an electric version of its Phantom car. The Rolls-Royce 102EX Phantom Experimental Electric is kitted out with a battery believed to be the largest of any electric car yet. At the moment the car is just a prototype – the company wants to get some feedback from its customers before they start to produce more. The BBC’s Jorn Madslien was one of the few journalists given a first look at the car. A tongue-in-cheek Twitter user giving “updates” on a missing deadly Egyptian cobra now has some 154,000 followers. The 20in (50cm) venomous snake escaped from New York City’s Bronx Zoo on Friday, and is yet to be found. In its Twitter account, The Bronx Zoo – which has some 237839 followers – admits it is currently “the snake’s game”. it is following just 1 – The Bronx Zoo!! One of the more recent posts played on New Yorkers’ fears of the scaly escapee. The move was also good PR for the city, he said. 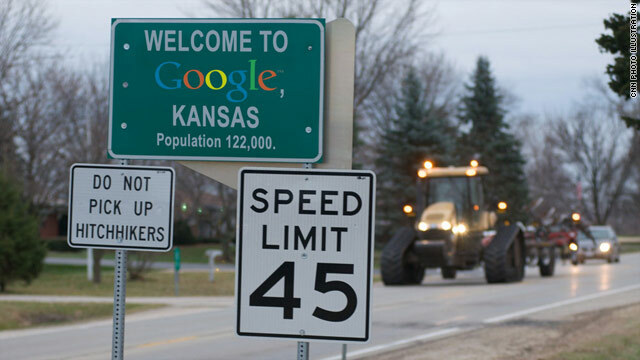 On April Fools’ Day 2010, Google joked that it had changed its name to Topeka as a sort of hat tip. The search giant on Wednesday announced it had chosen Topeka’s blandly named neighbor — Kansas City, Kansas — as the winner of its contest. That city, just 60 miles to the east of Topeka, soon will get some of the fastest internet connections in the country. The first edition of Think Quarterly, based out of the UK, is a 68-page dive into the world of data and its impact on business. The articles themselves are thought pieces about major business and technology topics from a variety of freelancers and contributors. The concept store, will feature its largest range of home entertainment products and accessories in branded sections, such as Apple, Sony and Hewlett-Packard. JB Hi-Fi continues to pursue growth through its bricks and mortar model, but it also sells online. Otellini, who also serves as Intel’s president, received a base salary of $US1m last year, the same as in 2009 and 2008. He also was awarded a special bonus of $US30,400. Intel said it paid a bonus equivalent to three day’s pay to all eligible employees for helping the company make 2010 the first year that its revenue exceeded $US40 billion. NINE out of ten metropolitan households (89 per cent**why not 90%**) have at least one digital TV, up 29 per cent compared with a year ago, according to ratings body OzTAM. high-definition technology, which can be found in 82 per cent of metro homes. The penetration of personal video recorders is also increasing, with 40 per cent of metro homes containing a PVR compared with 28 per cent a year ago. media buying agency UM announced it would no longer buy video ads with the publisher after research showed that videos, which play automatically when a reader opens the page and often slow down page loading, were having a negative impact on brands being advertised. The research showed that 96 per cent of people found the autoplay practice annoying and 44 per cent were muting their computers when videos played unprompted. A number of media agencies have standing rules not to buy advertising in autoplay videos, and The Australian understands several other agencies are now thinking of joining UM in the boycott. clients — which include Coles, Microsoft and the federal government — will no longer use its video service may be the tipping point. Take-up for wireless internet jumped by 50 per cent in the year to December 2010, pushing access numbers to 4.2 million. Wireless now comprises 40 per cent of Australia’s internet service market and has grown steeply every year since 2006. The story is very different for slow dial-up connections, which have plummeted from almost 50 per cent of the market in mid-2006 to seven per cent by the end of last year. For the first time, internet subscriptions have jumped past the 10 million mark. The infamous Anonymous is it again, this time taking on Sony and possibly its technology defense firm to boot. Yesterday, Anonymous warned Sony that it would be the latest to incur the group’s wrath. The company’s legal crusade against PS3 hacker George “GeoHot” Hotz and others has gotten the attention of the hacktivist group, which is making a name for itself when it comes to DDoS attacks in recent months. There was also a fraction of the group (or very possibly, detractors trying to culminate some negative attention) who threatened Sony employees’ family members. While we’re suspect of that particular detail, there’s no denying Anonymous wasn’t bluffing about it other plans for Sony. Virtually unheard of three years ago, mobile app stores are now huge business. Here’s how the major players stack up against each other. Last month Amazon threw open the doors on its very own Appstore, creating a new place for users of Android devices to find apps. At the same time, Apple has been vigorously challenging anyone and everyone over the use of the term “App Store,” while Microsoft last week bragged about the integrity of its apps in the Windows Marketplace. Clearly app stores, which three years ago were a relatively unknown thing to anyone outside of the gaming world, are now big business—for owners of platforms, developers, and ambitious third parties like Amazon. It’s easy to see why: a mobile platform is only as strong as its app store. As Nokia CEO Stephen Elop observed prior to his company’s embracing of Windows Phone 7, phone makers are in the business of selling “ecosystems,” not phones, and the capabilities of a platfom’s app store (or stores) is a clear picture of that. Beyond just the sheer number of apps on offer, a store’s payment system, return policy, and whether or not it vets apps prior to putting them in the store can be just as important to customers. WHO IS ROLLING OUT THE NBN? As the head of NBN’s construction team hits the road, Opposition spokesperson for Communications, Malcolm Turnbull, enters the debate, once again. Patrick Flannigan, who has just resigned from NBN Co just days after it was forced to suspend construction tenders negotiations leaves the whole project in jeopardy, Turnbull says. ope, your eyes aren’t playing tricks on you. The C64 is back for 2011 in a new multi-OS Linux + Win + Commodore box. It’s like adulthood never happened. In an unlikely triumph of unabashed fandom, the Commodore 64 is on sale again, lovingly brought back to life by a stalwart group of Commodore devotees, and soon to be available to kids that never grew up the world over. t’s powered by a dual-core Intel Atom D525 1.8GHz CPU on a mini-ITX motherboard and sports Nvidia Ion 2 graphics, 2GB of RAM (upgradeable to 4GB) and even an optional Blu-ray optical drive. But while the innards might have been updated to provide you with a functional, contemporary PC, the presentation of the remake is unmistakably “vintage”. The keyboard, which, like the original C64, houses the computer itself, has been painstakingly modelled after the original design, down to the shape, colours and contours of the keys. In another throwback to the original device, the C64x runs Commodore OS, a Linux-based operating system which can emulate the old C64 interface, letting you run “classic 8-bit, 16-bit and 32-bit era software” originally made for Commodore PET, Vic20, C16, C64, C128 and AMIGA (and you can even toy around with BASIC). But where would you even get that software these days? Commodore USA has a solution: “No need to bother with floppy disks, as many games can be legally purchased and downloaded from the internet directly on to your computer.” We’re not sure if the C64x has an App Store in its future, but apparently the OS features a media-centre style application that allows you to preview and select software. And for those who like the retro stylings but might actually need to get a bit of work done on their PC these days, the C64x also supports dual-booting with Windows (and presumably Mac? ), so really, what’s not to like? The C64x is available for sale in a number of configurations from Commodore USA online here (the Basic version retails for US$595), and you can find out more about the complete specs here. And note: Commodore OS is still in development but will ship to purchasers once complete. In the meantime the C64x comes pre-installed with Ubuntu 10.04. With a geeky, tongue-in-cheek Star Trek themed product launch, Acer today brought us into “First Contact with Acer Iconia technology.” So what does that mean for you? Boldly (ahem) entering the tablet arena with a number of touch-enabled models, Acer today launched its new Iconia range, bringing us a number of new devices ranging from an Android 3.0 Honeycomb tablet retailing for a (market-cheapest?) $499 and extending through to a deluxe Core i5 Windows 7 dual-touchscreen notebook sans keyboard for $2,499. In short, APC witnessed a dizzying array of touch functionality aimed at users in both consumer and enterprise markets, including a new hybrid product, the productivity-oriented W500 tablet, which runs Windows 7 and magnetically attaches to a full-size chiclet docking keyboard. Starting things off at the ultra-affordable end of the spectrum is the new Iconia Tab A100. It’s a 7-inch 1,024 x 600 Wi-Fi tablet running Android 3.0 Honeycomb. It features a pretty meagre 8GB of storage, but at only $499, it’s aggressively priced and likely indeed to be the cheapest entry-level Honeycomb tablet in town when it launches next month. In fact, that storage shortcoming is the only real let-down: it runs on a 1GHz Nvidia Tegra 250 dual-core CPU, includes 512MB RAM and features 5.0MP/2.0MP rear/front cameras. Not a bad spec for a 7-inch tablet, given that the original Samsung Galaxy Tab launched at double the price less than five short months ago. The A101 model has the same basic feature set but adds 3G connectivity. The “hero product” of today’s launch is the A100’s big brother, the Iconia Tab A500. Available in 16 or 32GB versions and starting at $579, it sports an almost identical set of specifications but features a 10.1-inch 1,280 x 800 display. It also obviously weighs more, 700g to the A100’s 450g, but still comes in at a fairly slim 13.3mm thick. Similarly to the A100/A101 breakdown, the A501 comes with 3G in addition to Wi-Fi. The Iconia Tab W500: looks like a notebook, but actually that’s a tablet docked with its matching keyboard. Perhaps the most unique product of today’s Acer launch is the Iconia Tab W500. It’s also a 10.1-inch 1,280 x 800 tablet, but that’s where the similarities end. Not another Android tablet, the W500 instead runs Windows 7 on an AMD Dual-Core C-50 processor with 2GB RAM and 32GB SSD storage. What really stands out however is that the W500 is made to magnetically attach to a keyboard docking station. In this sense, it’s being marketed as a “100% Productivity” tablet: sure, you can play Angry Birds on the train, but dock it at your workstation when you arrive at the office and it becomes a fully-fledged Windows PC. It’s an interesting feature, reminiscent of Motorola’s dockable Atrix smartphone, and something we’re likely to see more of as the “Post-PC product” market matures. The W500 retails for $899 and will be available in May. The Iconia dual-screen touchbook: no physical keyboard for a touchy-feely experience. Rounding off today’s Acer launch was the new Iconia dual-screen touchbook. Strikingly reminiscent of last year’s Toshiba Libretto W100 in concept, the touchbook is essentially a notebook PC, but the physical keyboard is replaced with a secondary touchscreen, which variously provides a virtual keyboard, touchpad and additional display area. Much like with the Libretto W100, the touchbook is visually spectacular when you see one close up, but whether users will actually take to such a device is another question, particularly given the high cost of these dual-touchscreen models: the touchbook in this instance retails for $2,499. For your money you get a Core i5-460M CPU, up to 4GB of RAM and 640GB of hard disk space. Oh, and twice as many reasons not to drop it. Inflight Wi-Fi: is Australia falling behind in air comms? Staying connected while in the air is fast becoming a reality (overseas), but Qantas and Virgin Blue are still staying mum on their plans. If you’ve been lucky enough to travel in the United States recently, one thing might have particularly struck you as an APC reader – nearly all domestic planes have Wi-Fi internet in them. While it might be exaggerating to say Americans now take this for granted (they’re still pretty excited about it, in truth), they are as used to having inflight broadband as we are to having the world’s fastest mobile network (Telstra Next G). So, why is it taking so long to come to Australian domestic aircraft? It’s hard to get a straight answer out of anyone, really. Even though Qantas’ now slightly-infamous but nonetheless state-of-the-art Airbus A380s have an in-seat web browser and Wi-Fi installed in the aircraft, the plane is not actually linked to the internet yet. Qantas blames the Australian Communication and Media Authority (ACMA), saying it’s a regulatory issue. ACMA, in response to APC’s enquiries, said there was nothing preventing Australian airlines from providing inflight broadband, as long as all the equipment on the plane satisfied the requirements of the Radio Communications Act. However, it did say that while Australian planes are always subject to Australian radio communication regulations, airlines were also subject to the radio communication laws of countries they flew over, creating a layer of complexity for airlines. In the US, inflight Wi-Fi is common in domestic flights. Meanwhile, Virgin Blue has nothing to announce on inflight internet, however its new CEO, John Borghetti, formerly Qantas’ head of marketing, is open about the fact that he is looking at every angle the airline can take to pull the rug out from underneath Qantas’ lucrative business traveller crowd. Logically, he must be looking at inflight internet as a key competitive advantage that Virgin Blue could add to its fleet as it tries to attract business travellers. Interestingly, Virgin Blue uses an inflight TV service called “LiveTV”, which is owned by the US airline JetBlue. JetBlue has recently adapted the LiveTV system to offer internet access over its satellite link as well – which suggests Virgin Blue might be able to do the same. One thing that does look likely to come sooner rather than later – because it has been specifically approved by ACMA – is global roaming inflight, where your airline provides a pico-cell in the plane that your phone or 3G laptop/tablet could connect to for data/SMS. The airline would be required to jam signals to terrestrial base stations from your handset, to prevent handsets from going to maximum transmission power mode (civil aviation regulators still fear that hundreds of mobiles transmitting at full power in an effort to communicate with ground towers could cause interference with aircraft systems). Usage would be billed to you as if you were travelling in a “foreign country” – that is, it’s expected to be very expensive. Telstra, surprisingly, complained vehemently about this arrangement, arguing that airlines should charge a flat per-flight access fee, and then allow customers to communicate via the aircraft with their existing carriers and have usage billed into their standard phone plans. The situation for international flights is far better than for Australian domestic flights, fortunately. Lufthansa is the first international airline to actually reactivate inflight internet in a small number of planes on its Frankfurt to New York route and says it will roll it out progressively across its entire fleet. Unfortunately, though, it doesn’t fly to Australia, so you won’t get the benefit of inflight internet on the long haul flight from Australia to its hubs in Europe. Other closer airlines are gearing up to introduce inflight internet this year and next year: Singapore Airlines (first half of 2011); Emirates (2012); and Cathay Pacific (2012). Many international airlines are rolling out inflight internet this year, but will Australian routes be covered? In America, the dominant inflight internet system is called “GoGo”. It uses a grid of land-based mobile phone towers with antennae pointed at the sky, transmitting EV-DO signals to planes. (You may remember EV-DO from when Telstra operated BigPond Wireless over it – it’s an overlay to the CDMA mobile network standard, and was shut down in Australia along with the closure of the CDMA network in favour of 3G/HSPA). The signals are retransmitted inside planes by Wi-Fi. Pricing is keen – a flight pass for a short flight can be as little as $4.95, or a month’s unlimited access costs $34.95 – but regularly goes on sale for $19.95. Over the last Christmas period, Google sponsored the cost of providing it to passengers free of charge as a promotion to encourage the use of its Chrome web browser. However, such a system isn’t viable in Australia, because while America is inhabited right across its continent – and requires mobile towers right across – Australia has vast tracts of uninhabited desert that planes fly over with no need for mobile coverage. Other inflight internet systems are generally provided by satellite link to the plane, with a LAN provided inside the plane via Wi-Fi and Ethernet. They vary vastly in capacity, though. For example, Airbus/SITA’s inflight internet system, called OnAir, uses an Inmarsat SwiftBroadband satellite connection, which provides only 432Kbit/s to be divvied up between the whole planeload of passengers. On the other end of the spectrum, Panasonic Avionics’ inflight broadband system, called eXconnect, offers a symmetric down/uplink speed for the plane of 50Mbit/s – more than 100 times faster than the Airbus system. Oddly, although Qantas has installed Panasonic Avionics inflight entertainment systems in its A380s, the seat-back web browser displays error messages referring to the Airbus OnAir connection not being present, so it’s not clear whether Qantas plans to use the slow OnAir service or is considering using Panasonic’s superior system instead. Wait up… didn’t we already have this 10 years ago? Spot on. Boeing spent a billion dollars building an inflight internet system that blanketed the world’s aircraft with a satellite signal, which was rebroadcast inside planes via Wi-Fi. However, the US aircraft giant pulled the plug when its board decided to cut its losses after failing to get enough customer usage of the system. So what went wrong? The equipment cost $500,000 per plane and was extremely heavy at around 450kg – nearly half a tonne of extra weight that airlines had to freight around the world on each flight. It also took several days to install the Connexion routers and wiring, costing airlines millions of dollars in lost ticket revenue. Finally, it was probably a bit before its time – between 2001 and 2006 (when Boeing pulled the plug), most people still had regular candybar phones, not smartphones, and weren’t as used to having email in their pocket at all times as they are today. Airlines also did a very poor job of marketing the service, often failing to include any brochures in seat pockets, signage in the planes or announcements of the availability of inflight internet on flights. This story was written by Dan Warne, a former APC staffer who now works for Australian Business Traveller.